The answer is nothing. Absolutely nothing. 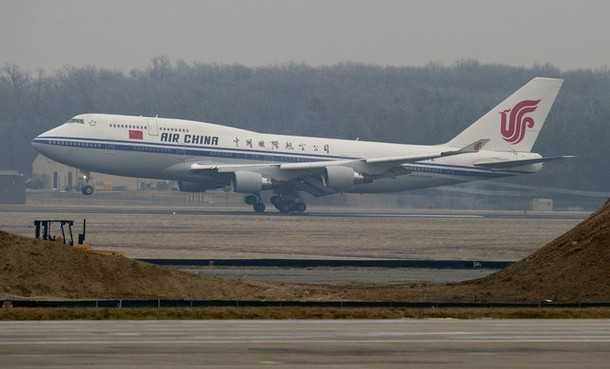 That commercial jet contains Hu Jintao, the president of China. When Hu and his wife, Liu Yongqing, stepped out of the Air China commercial jet and waved, the crowd chanted “Huanying! Huanying!” or “Welcome! Welcome!” Many shook Chinese and American flags. “He is not an emperor and he doesn’t want to be,” we are told of this Chinese president. And he’s living up to that. The guy who is lending Barry Hussein a trillion dollars so Obama can continue spending beyond-crazy recklessly showed up to America practically carrying his own luggage. Why can’t WE have a communist president like that? Unfortunately, our Marxist president is more of the Stalinist “talk about the poor people while living a life of magnificent luxury” sort of communist. – to see what I’m talking about. It’s not like I’m making anything up. And the Chinese communists demand less in taxes than our “spread the wealth around” redistributionist socialist president. Which communist leader do you like better? Man, Democrat communists sure do love their jets and their perks whilst continually talking out of their anuses (while moving their lips to fool the ignorant), don’t they? Well, two things: 1) Obama enjoys privileges that no “Wall Street fat cat” who ever lived enjoys. Once Obama took Air Force One to Chicago for a “date night” with his wife. That trip deprived millions of starving children of food and polluted the atmosphere for a billion years. And 2) After trash talking Wall Street fat cats, Obama actually had the balls to hire a J.P. Morgan fat cat as his chief of staff. Obama plays the same games that corrupt despots have always played. On the one hand, he demonizes the rich to score points with idiots who don’t know up from down. On the other hand, he lives a life of luxury that none short of the most self-absorbed emperors have ever lived. Why don’t you be consistent for just once in your miserable life, Barry Hussein? If you’re going to go around demagoguing the rich, why don’t you at least do so flying commercial like Hu Jintao? Clearly it can be done, because Hu is doing it. Hypocrisy is the quintessential defining essence of Democrats like Barack Obama and Nancy Pelosi. And if you were to take away the hypocrisy, you’d have nothing but empty suits (and pant suits). You’ve probably heard the scuttlebutt: an Indian official stated that Obama’s visit was going to cost $200 million a day (for ten days = $2 BILLION). Seemingly every election day estimate predicting increasingly bad news for Democrats is met by an exponential rise in the cost to taxpayers for President Obama’s “I’m outta here” world tour. Coincidence? Mumbai: The US would be spending a whopping $200 million (Rs. 900 crore approx) per day on President Barack Obama’s visit to the city. “The huge amount of around $200 million would be spent on security, stay and other aspects of the Presidential visit,” a top official of the Maharashtra Government privy to the arrangements for the high-profile visit said. And if the Democrats lose the Senate, expect another $50 million in room service tabs alone, Tea Party ingrates. To put it in perspective, $200 million is enough money to buy a pair of Lanvin sneakers for over 370,000 Indians. The mainstream media was quick to jump all over this story (unlike, say, the falsehood Obama spread that John McCain owned seven homes when in fact he didn’t actually own any homes). Let’s see. Forty aircraft. Six armored cars. “The biggest trip ever by a US president.” Then there’s the 34 U.S. Navy warships dedicated to Obama’s convenience, the 3,000 attendants traveling with their emperor, the entire Taj Mahal booked. And lets not forget the palm trees and all the coconuts. It all sounds like “Let them eat cake” on massive loads of steroids to me. But no. This is Barack Obama, who has grown government that took more than 200 years to get this monstrous by an eye-popping 28% in just two short years. This is the guy who has spent trillions of dollars in debt-fueled spending. This is the guy for whom your money doesn’t matter. So fine. It costs a gazillion dollars for Obama to see a museum. But it’s only your money. I don’t know how much this trip to India is costing the taxpayers (or more precisely, the children’s children’s children’s children of the taxpayers). But I do know that the cost means absolutely nothing to Barry Hussein.